xxxxxxxxxxxxxxxxxxxxxxxxxxxxxxxxxBertrand Russell, Education and the Good Life. These days, the emphasis of the penal system is on teaching inmates ‘functional skills’, abilities which are supposed to enhance prospects of getting a job ‘on the out’. I.T., Food-Safety, Industrial Cleaning and Graphics – these are examples of the training touted to those inside as the most likely to lead to employment after their sentence is served. In the spacious chapel to be found in any gaol, the governor may deliver a pep-talk to his staff. Employability is the word that keeps re-occurring. That is our purpose: to render these birds employable. It wasn’t always the aim of the nick. In the England of Mayhew’s day, many were sentenced to Hard Labour. Enlightened intellectuals, some with engineering skills, were impressed by innovative thinking in the sphere of retribution, particularly by the guillotine – once described as a horizontal plane with a vertical extension, from which a triangular attachment is dropped to separate the rectangular from the round part of the body. So swift, so economic, so geometrical! These progressives, as respected in their day as Foucault is in ours, espoused the notion that for toil to be truly adamantine it should be perceived as such, not merely experienced as a grind. 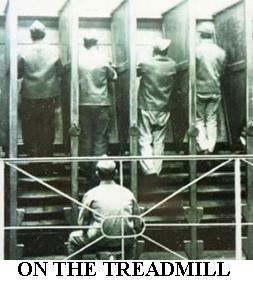 Thus was born the theory of useless effort, promulgated by the treadmill, the crank machine and shot drill. Pointlessness was integral to the punishment. 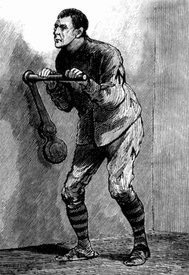 In some prisons the treadmill was underground – in a few cases it served a purpose, but more often it milled nothing, while the crank machine was simply a handle which the convict was obliged to turn 10,000 times a day. Behind a wall or within a box, it caused sand to be scooped up then dropped back into the same place. The screws to this handle could be adjusted as the officers thought fit – giving rise to the nickname that is still in use. Shot-drill involved moving a pile of cannon-balls from one corner of the yard to another, and then back again. Effort was thus identified as being lighter when it had a goal. Building your own house or loading a cannon’s mouth takes the punishment out of an arduous task. The whole point about hard labour is that, like Sisyphus, you have laboured in vain. These two extracts from Oscar Wilde’s Ballad of Reading Gaol attest to the fact that he was sentenced to hard labour. Here is a philosophy of time wasted, aimed ultimately at the destruction of the ego – this being the upstart that incarceration is dedicated to pulling down. To break the insurgent ego and thwart all ‘answering back’, another technique instituted was ‘the Silent System’. ‘Picking oakum’ involved separating the hemp fibre of rope remnants from accumulated tar – to gather the off-combings that were used for caulking the timbers of ships. Workshops of three to four hundred people would be engaged in this; an activity which went on for hours in strictly enforced silence. My ancestor Elizabeth Fry visited a ship full of female deportees and presided over an interval of silent worship, as is the Quaker way. The silence must have had ironic connotations. Scripture however was a permissible addition to the treadmill, whose cohorts sometimes had their heads positioned so that they were obliged to take in a religious text as they trod. Does this contaminate the pointlessness? I don’t think so. The task itself remains without purpose. For a prisoner such as Oscar Wilde, being forced to read the same text over and over again must have constituted additional torture. Of course there are plenty of treadmills still in use today – in Fitness First and the Nuffield health centres and in any other gym. The difference is that you pay to go on the machine. The sweet and sour perfume of well-earned sweat – paid for by your earnings – pervades the subterranean halls where machines very similar to the crank and the mill encourage a sense of achievement. Biceps, dorsals and the abs – each subsequent inspection reveals the improvement to one’s temple which constitutes the product. Rows of machines also generate the competitive conformity that gets our society’s endorsement. Actually competition functions best in a conformist context. Sport is epitomised by excellence in the activity duplicated by every other competitor in your heat. Parameters are precisely delineated. Our Olympic heroes progress to their apotheosis – a lucrative career in the advertising trade. My view is that competitions and prizes less successfully identify our best poets or the world’s finest tangueros. For all that, the arts are far from providing an arena where repetitive action without direct functional outcome meets with disapproval. Shot drill could easily be performed in the ‘Tanks’ of the Tate Modern. Endurance pieces done for their own sake have proved a mainstay of performance art. Stuart Brisley once dug a hole in the ground for as far as he could go. Mehmet Sander has put himself through gruelling choreographic work-outs within wooden frames – building up the body in his personal fight against AIDS. Here the purpose is clear. But shot drill could well be done as ‘art for art’s sake’, liberated from the illustrative pre-condition of dance (i.e. not movement to music) – the sort of procedure that could be explored in order ‘to discover a reason’ – as Fiona Templeton once said of the repetitive drills of seventies performance art. Such practices are still current. The ‘action’ may be one that a particular artist has devised, setting up the rules by which it may be assessed, and as such far from conformist. Thus the same movement can be a penance, an exercise or an artwork, depending on its context, as Foucault would be quick to point out. Returning to the penal system, how far have things changed? The functional skills so popular today, (each taught via a sequence of intelligence tests where what is being tested seems to be one’s ability to understand the question), have set up an environment where prisoners are helped to feel employable. From hard labour where the pointlessness was emphasised, we have moved to emphasising the point – but of what? Trouble is, for all the certificates, functional skills are pretty banal, and on the out, well, there is no employment. Prisoners get released into a harsh environment – that of freedom – and this is what they are not being trained to cope with, for functional skills (wash your hands before handling food) are pretty pointless when the job market for them doesn’t exist. It might be better to prepare those detained at Her Majesty’s Pleasure for freedom itself – which may very well involve joblessness – in addition to promoting token gestures towards their employability. Prison, by its nature, is occupied by unsuccessful felons who are poorly equipped to accept their release. All too easily led astray by their eagerness to conform, their low self-esteem leads to an anxiety that only acceptance by others can assuage. This conformity is reinforced by televisions in cells, the regime, the routine that trains them in incarceration. ‘Nonces’ and bent coppers have to be separated from the crims on the ‘main’ because that larger body of prisoners is notoriously homophobic – and, while it views the law with hostility it is scandalised nevertheless by a policeman’s misdemeanour. Traditional views of the family are strongly upheld, and are often authoritarian and sexist. Once outside, being accepted translates as doing what the gang expects of you (many of whom you may have met inside). All too often this results in you being nicked again, since once you have offended ‘the filth’ have your number, and expect you to be in a relaxed, celebratory and incautious mood for the first few months after release. Collared again, one finds oneself banged up once more. Many inmates seem frightened of freedom. In the art-room, those enrolled will slavishly copy a photograph, never venturing into drawing from life or from the imagination. ‘Graphics’ – which has replaced ‘Art’ in most institutions – actively abets this conservative approach: prisoners scan an image onto a screen, print it out, cut it into a stencil and print it once more on a t-shirt. The Skills Council no longer supports art, creative writing or distance learning. Yet it is precisely these activities which encourage independence of thought and the genuine getting of knowledge: attributes which may enable one to strike out on one’s own, set up a business or occupy one’s time in a fruitful way when no work is forthcoming. Freedom is a responsibility; one that many prisoners are loathe to take on, preferring to offend repetitively and in some cases to return to cells they have already occupied, as if a prior booking had been made. This entry was posted in Essays, Uncategorized and tagged body-building, Crank machine, Henry Mayhew, offenders, Oscar Wilde, Performance Art, prison, treadmill. Bookmark the permalink.